Surprise – a free printable!! 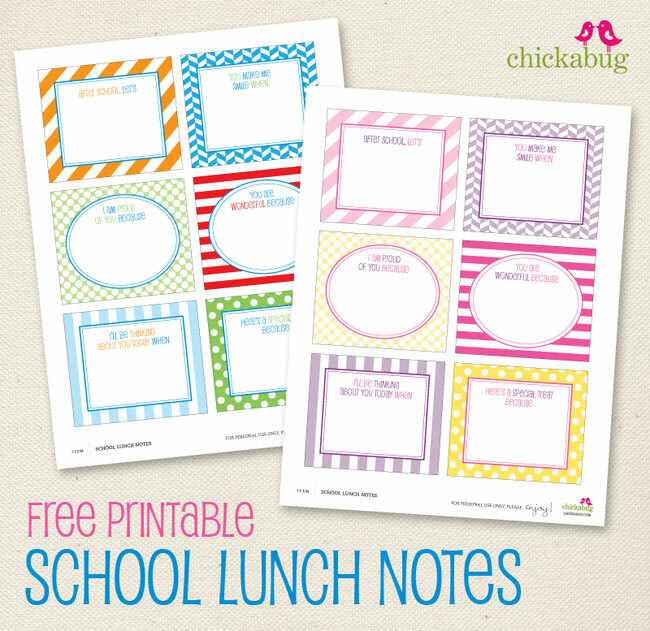 Some friends on facebook requested printable lunch notes for back-to-school, so I whipped some up for everyone to enjoy! There are also blank sheets (not shown) so that you can also come up with your own messages from scratch – or even draw a little picture. I love this, Heather!!!! I"ve been looking everywhere for some cute notes! Yay! Love them. Thank you, thank you, thank you!!! Thank you so much!!!!!!!!!!! I write my girls notes on napkins and have been for 5 years, but was just thinking today that I needed something cute to stick in there for them like a printable-how fun! I am so appreciative for you sharing these! Thank you for these really adorable notes. It's really nice to be able to send the kids a little positive note letting them know we love them and are thinking about them! Thanks so much for the cute stuff! It makes it so nice for moms like me who want to have all those special touches, but don't have time to come up with them on our own. You rock! Found you on Pinterest. Thanks for these--love them! WooHOO for Pinterest! ; ) Thanks for saying hello! These are adorable! My kids aren't in school yet, but I'm going to use them in their baby books, as I record their stories. Thanks for posting these. I send a note to my girls every day in their lunch. These are awesome. Thank you! You are so kind to share these with us! I love people like you who aren't looking for money but are so sweet to share their talents with us without charging. Thank you for all you amazing printables on your site! Love these lunch notes - you made my day! thank you - oh, it's wonky. . .better go review those earlier messages from others on how to fix it. Super cute. excellent - followed the directions and PERFECTION! Love all of your stuff!!! Thank you so much!! Thank you so much for sharing your school lunch notes. I love leaving fun notes for my kids but was running out of ideas. You are the greatest! So cute! Thank you so much for sharing!!! I love these! Are they by any chance formatted to fit the avery nametag template that is perforated? It looks awfully close! :) Thanks for sharing these! You have a fabulous website, and i am inspired. Thank you. Blessings to you and yours. NOTE: My website is not really active. I don't know what I am doing with it yet. I was actually laid up with a broken leg for 6 weeks as was inspired to do anything that involved mental creativity. These are adorable and so FUN! Thank you so much..I'm using the blank ones for jokes, to put inside the lunch boxes lol! These are so cute. I am going to give them to my daughter so she can put them into my 2 grand-daughters lunch boxes. thank you so much. What a great idea, I will start using them with my daughter, she will love all the notes. thank you very much. Laurie Berkner posted this link on Facebook for the school lunch notes but now I've discovered a whole new site for me! Thanks! That's so nice, Brenda! : ) I do have a lot goin' on - I'm glad you found me! How do I go about printing the cute jokes to put in my daughters' lunch boxes??? I tried to download, but it tells me the file is damaged (and won't open). Can you please send me a link? I tried to download the lunchbox printables, but it tells me the file is damaged (and won't open). Can you please send me a link? I love them!! I can't wait to use them Monday. Hi Ethel, I emailed the file to you at et——----@hotmail.com.